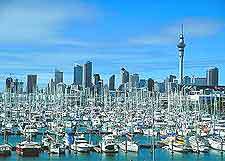 If you are a sports fan on holiday in Auckland and wish to either watch a game of cricket or a rugby match, or perhaps try your hand at surfing or yachting, the city will far from disappoint. Eden Park currently serves as the city's biggest stadium and resides within the south-westerly neighbourhood of Sandringham, alongside the suburbs of Mount Eden and Kingsland. Boasting a capacity exceeding 50,000 spectators, Eden Park is called home by sports teams such as both the Blues (rugby union) and the Auckland Aces (cricket), as well as the governing body known as the Auckland Rugby Football Union. If you are simply looking to keep-fit whilst away from home, then a plethora of gyms and fitness centres are on hand, a number of which reside within the biggest hotels. However, those feeling brave and looking for an adrenaline rush to remember may like to try the daring Harbour Bridge Climb, or perhaps sky jumping from the city's famous Sky Tower. Alternatively, you can head to the 'nearby' town of Rotorua (roughly three hours to the south-east) for an afternoon of white-water rafting. The cricket season in New Zealand runs from October to March. New Zealand has become famous the world over for its accomplished cricket teams, with the city's Eden Park Outer Oval playing host to many matches and tournaments, including the 2015 Cricket World Cup. Auckland is renowned throughout New Zealand for its exceptional beaches, a number of which often feature reliable surfing conditions. Some of the most popular areas for surfing in reasonable proximity to the city include Piha Beach, Karekare Beach and Muriwai Beach, on the west coast, as well as both Bethells Beach (north) and Raglan Beach (south). Surfing equipment is readily available in Auckland, where it can be easily purchased or hired, while beginner lessons on the beach can often be arranged. The clear waters around Auckland's scenic coastal areas tend to lend themselves to snorkelling and scuba diving. Notable dive spots around the city include the west coast of the Great Barrier Island, and the famous Rainbow Warrior Wreck next to the Cavalli Islands. 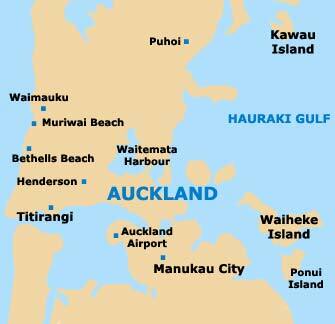 Also very much of note is the Coromandel Peninsula, which takes around two hours to reach by car from Auckland and includes the Hahei Marine Reserve, the Mercury Islands and the Tairua area, all of which are excellent locations for scuba diving. 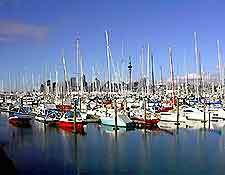 There are a number of sailing, canoeing and sea kayaking schools in the Auckland area, suiting both experienced and novice sailors alike, and boasting impressive city panoramas and views across the Hauraki Gulf. The tour company Outdoor Discoveries provides sea-kayak tours and rentals, offering excursions to Browns Island and Rangitoto Island, as well as along both the Matakana River and the Puhoi River. Lasting around five hours in total, the 'Paddle to the Pub' trip is especially enjoyable, with its lunchtime stop-off for a pint and a bite to eat. Tenpin bowling is a popular recreational pastime for families in Auckland. Standing opposite Mount Wellington and close to the Bill McKinley Park, the Tenpin Bowling Panmure Centre is to be found within the eastern suburbs, where it includes 24 lanes, shoe hire, video games, cafés and a bar. Also onsite is the M9 Laser Skirmish, where you can battle with an opposing team using laser guns. The coastline around Auckland often features conditions suitable for swimming, with good opportunities being found at the Awhitu Regional Park, the Omana Regional Park and around Waiheke Island. Both Raglan Beach and Takapuna Beach also lend themselves to swimming, while residing on the western side of the city is the Big Top swimming pool, on Alderman Drive, which was originally built for Auckland's Commonwealth Games in 1990 and boasts an Olympic-size pool. The city has become well-known in New Zealand for its neighbouring groups of inquisitive bottlenose dolphins. Regular dolphin swimming trips depart from Auckland's Pier 3 throughout the year, where you can get up close to these friendly creatures. Other noteworthy locations where you can swim with dolphins include Kaikoura (the South Island) and Paihia (the Bay of Islands). Some of the best locations for fishing in Auckland include areas around the Waitemata Harbour and the many Hauraki Gulf islands. Modern fishing charters often come with radar tracking devices, meaning that you are likely to return home with a decent catch. Amongst the main game fish in these waters are hapuka, marlin, snappers and yellow tail kingfish, as well as various sharks of all sizes. Deep-sea fishing trips head out into the Hauraki Gulf, around the island of Cover Kawau and the Flat Rock area, as well as both the Little Barrier and the Great Barrier. Anglers joining one of the regular Sandspit Fishing Charters will be able to stop at the popular Sandspit Cafe after docking, where your freshly caught fish can be cooked up for your supper. Those looking to enjoy a day of biking may like to consider an excursion to the Woodhill Mountain Bike Park on Restall Road, located roughly 30 minutes to the north-west of the city centre. Past events staged here include the Big Bike Day Out, the Team Elevate Challenge and the Woodhill Dirt Jump Open. Further trails and cycleways offer views of the surrounding coastline, beaches and bays.